Could your business be the next champion of Hartlepool? The 2018 Hartlepool Business Awards winners. Calling all Hartlepool businesses - the search is on to find the cream in the town’s industry. 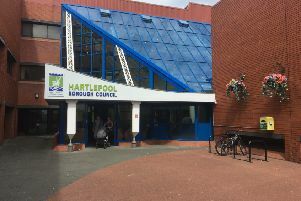 The Hartlepool Business Awards are back and this year’s competition will conclude with a grand finale awards dinner at the Borough Hall on Thursday, May 16. Businesss Leader of the Year award winner Rob Collier (centre) of Advanced Retail Solutions at the Hartlepool Business Awards 2018, with Andrew Steel (left) and Hartlepool MP Mike Hill (right). But before then, firms across the town are being urged to put themselves forward for honours. Awards co-ordinator Andrew Steel said: “Follow the simple online entry instructions for the Hartlepool Business Awards. If shortlisted, the judging panel may arrange a visit to discuss your business in more detail. This year’s hopefuls will be hoping to follow in the footsteps of Seymour Civil Engineering which took the Overall Business of the Year title at the 2018 awards. Shortlisted companies will be offered two complimentary tickets for the dinner where you’ll find out if you have been chosen as the winner in your category which carries a prize to the value of £500. Other winners included Rob Collier who was Business Leader of the Year, JDM Earth as the Best Small Business, Orange Box Solutions as Most Promising New Business, and Families First North East which was chosen as the winner in the Hartlepool Mail-sponsored Community category. Mr Steel added: “The Overall Business of the Year will be chosen from a new category and a separate entry form. Those businesses that do not wish to enter individual categories can enter for Overall Business of the Year separately. “Those businesses who are entering individual categories will need to enter for the Overall Business of the Year in addition to their category entries. The Overall Business of the Year winner attracts a £1000 prize. To enter the business categories, visit http://hartlepoolbusinessforum.co.uk/application. The 2018 Hartlepool Overall Business of the Year Award winners, Seymour Civil Engineering. To enter for the Business of the Year Award, visit http://hartlepoolbusinessforum.co.uk/application/business-of-the-year-entry-form. Tickets for the awards night - which includes a three-course dinner - are £450 for a table of 10 or £45 each. To reserve tickets, call (01429) 283802 or email Cheryl.Menzies@hartlepoolfe.ac.uk. The Hartlepool Business Awards 2018 at The Borough Hall, Hartlepool. Service Sector, sponsored by Tilly, Bailey & Irvine. Manufacturer of the Year, sponsored by Waltons Clark Whitehill. Community category, sponsored by the Hartlepool Mail. Business Leader of the Year, sponsored by the Hartlepool Business Forum. Tourism, Leisure and Hospitality, sponsored by the Passport Group. Creative Industries, sponsored by The Northern School of Art. Young Entrepreneur category, sponsored by The Gus Robinson Foundation. Most Promising New Business, sponsored by Beaumont Consulting/Hartlepool Enterprise Centre. Investment in Training, sponsored by Hartlepool College of Further Education. Overall Business of the Year, sponsored by The Gus Robinson Foundation.